Have a beard or know someone who does? At The Penny Rose we're known for being a women's fashion and beauty blog, but lots of us have men in our lives and they deserve some beauty love, too. Keep an eye out on the blog for upcoming stories for the men who love beauty products and the women who love them. I always thought a trim and comb to the beard was enough to start my day. But after being introduced to Modern Beard, a Santa Cruz-based men’s skin and beard line, I have a whole new daily regimen. Modern Beard is a new game-changer in the beard industry. 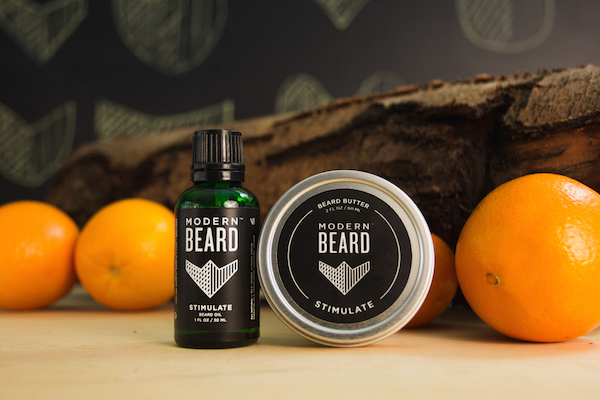 Founded in 2014 by Chris Michel, Modern Beard offers a line of high-quality beauty products for men. Recently I had the chance to try out the two items from the line: Stimulate, a subtle citrus and tangerine blend that offers a soft and sculpted quality to my facial hair immediately after application. Naked is composed of base carrier and all-natural oils including jojoba, almond, and argan that left me wondering: why didn’t I start taking care of my beard earlier? I recently had a chance to catch up with the founder of Modern Beard, Chris Michel. Why should men use beard products? A lot of people might say that only bearded men should use beard products. But all hairy men, even ones without a beard, can benefit. Take beard oil for example. Every day a man doesn’t shave can lead to itching. Using beard oil on the skin and coarse hairs between shaving days will keep the skin nourished and healthy, making shaving even more comfortable and pleasant. How did Modern Beard come to life? I’d seen beard oils floating around for a few years. I sampled a few and loved what they did for the beard, but I didn’t want to smell like a forest every day. I knew there had to be men who wanted something fresh and different in a product. I wanted to make sure Modern Beard spoke to the modern man who is more than just a burly mountain man. We hope to catch women or men that have a bearded loved one and want to buy them something special, as well as, the bearded man who seeks to have the healthiest face-curtains a man can grow. Modern Beard products are made with all-natural ingredients that we source from various locations. We won’t put anything in our products that hasn’t been tested on real facial hair from real men. In fact, we recently had someone give us a beard oil review where they ate our oil without any adverse effects. We don’t recommend that you do this! Tell me about the two products you currently sell? Right now, we have two recipes: Naked and Stimulate. Naked contains jojoba oil, almond oil and argan oil. Jojoba oil regulates natural skin oils to keep skin and hair healthy. Almond oil helps maintain moisture levels in the skin, which creates a growing environment for facial hair. Argan oil improves overall hair and skin softness. Stimulate contains the same oils along with tangerine and orange scents. As of now, what is the difference between the beauty and beard industry? I think the beauty and beard industry go hand-in-hand. Heck, they might even be the same thing. What the world is now starting to realize is that beards are natural and beautiful and should be taken care of like any other part of our body. Modern Beard is available on our online store at modbeard.com, where we ship anywhere and provide details about wholesale options. For people looking to buy locally, we’re stocked at Salon on the Square, Faust Salon in the Capitola Mall and Bubble Lounge on Pacific Avenue in downtown Santa Cruz, and we’ll be expanding this year.